The perfect eagle picture is hard to achieve but Grizzly Bear Lodge tries to provide the perfect opportunity. 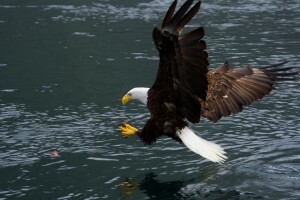 First by keeping an eye out for bald eagles on the whale watching trip, grizzly bear tours and extra day at the river. Secondly when the resident eagles are still in their nest behind the lodge we will occasionally throw out a bottom fish and encourage them to come for an easy meal. Glen, one of our guides, provided another great photo. The spring grizzly bear tours from the lodge are in Knight Inlet’s Glendale River estuary and the tidal portion of the river. In late summer after August 24th we use the viewing stands, which are a ten-minute drive up the river valley. If time permits and the tide is right, in the fall, we may also take a boat ride up the river. 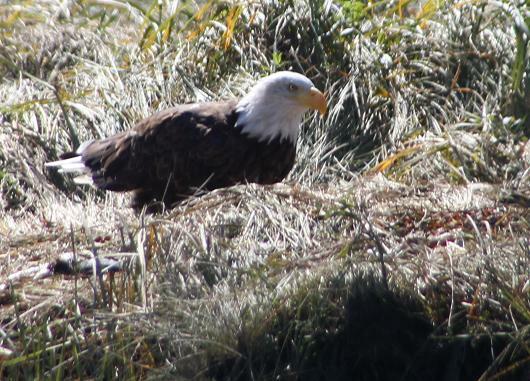 On this day a bald eagle was enjoying the sun on the riverbank. While not so much the sun as the remains of salmon that a grizzly bear had left on the bank. The carcass of the salmon is visible in the grass beneath the eagle’s tale. Many of the eagles that would normally be along the shores throughout out coastal BC move into the rivers once the salmon arrive. It becomes a free buffet that is hard to resist.